Quick Info — Overview of the Tribunal expansion pack. Souls — A list of new souls to trap in Tribunal. Creatures — A list of the new creatures added by the expansion. Factions — Information on the different factions of Tribunal. Maps — A complete overview of Mournhold, and the sewers and ruins that lie beneath. People — All of the named individuals in Mournhold. Places — The city of Mournhold, as well as sewers, ruins and other locations in Tribunal. Services — Services offered by citizens of Mournhold. 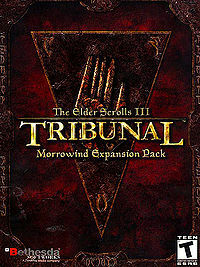 Tribunal Patches — Official patches for Tribunal by Bethesda Softworks. Easter Eggs — A list of easter eggs and other oddities in Tribunal. Glitches — Known glitches and oversights in Tribunal. Esta página foi modificada pela última vez à(s) 14h25min de 26 de janeiro de 2016.